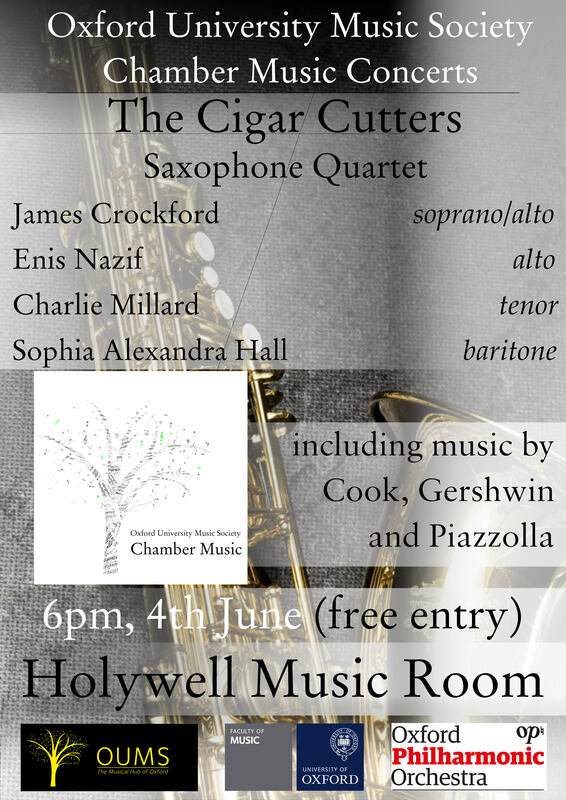 The Cigar Cutters is a newly formed Quartet made up of Oxford’s most talented saxophonists. The Quartet are based at the University and consist of a member of staff, a PhD Student, a Postgraduate statistician and an Undergraduate music finalist. Since making their debut performing in University Church last term, the Quartet have played in multiple Oxford colleges including Oriel, Exeter, Hertford and Jesus, and are very excited to be making their first appearance at the Holywell Music Room. The ensemble plays a wide range of repertoire from Gershwin to Piazzolla, and Shearing to Brecker; the Quartet especially has a strong background in Jazz and all of its members have performed with either the Oxford University Jazz Orchestra or the Cambridge University Jazz Orchestra. When not in rehearsals, The Cigar Cutters can often be found jamming together at the University’s Jazz Society on a Tuesday, or at the pub planning their next concert. Please email David Palmer at chambermusic@oums.org with any queries about this event.